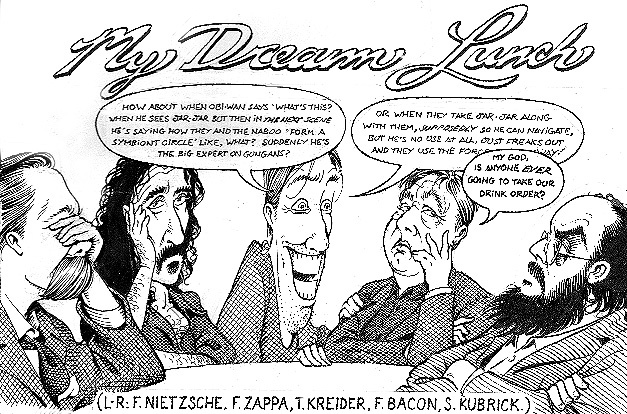 For our younger visitors (or those with other interests), the figures I've chosen for this cartoon are: Friedrich Nietzsche, German philosopher, author of Thus Spake Zarathustra and Beyond Good and Evil; Frank Zappa, American musician, whose albums include Uncle Meat and Joe's Garage; Francis Bacon, Irish/English painter whose portraits all have nondescript titles but most famously include the "sceaming pope" series; and Stanley Kubrick, American director of Dr. Strangelove and 2001: A Space Odyssey, among other films. If you are not familiar with these men and their works, let me suggest that you really should be. In addition to being great artists they were all brilliant and funny and erudite men, and would undoubtably have made for first-class conversation. Unhappily, almost all the celebrities I really admire are dead. I guess we've all thought about which historical figures we'd most like to have lunch with. What you never think to ask yourself is: why would any of those people want to have lunch with you? I could go on about glaring plot inconsistencies in The Phantom Menace, but perhaps this isn't the place.